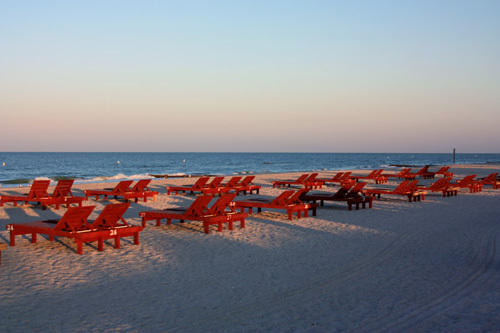 Located on the Gulf beaches west of St Petersburg, it is clean, quiet, and laid back. Although it looks crowded with high-rise condos, the charm of Madeira Beach FL is its unhurried, Old Florida pace. Young families with small children enjoy it just as much as those who seek an uncluttered beach retirement. This is NOT a little coastal town lined with jumping beach bars and fast food franchises. The main focus is the beach itself. 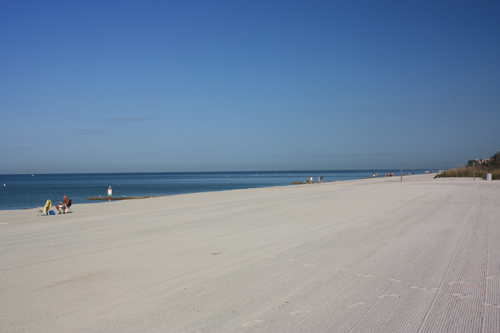 With its sugary white sand that squeaks when you walk, its ease of public access, and its small Mom & Pop establishments across Gulf Blvd, it is easy to understand why it is considered one of the top Florida beaches. 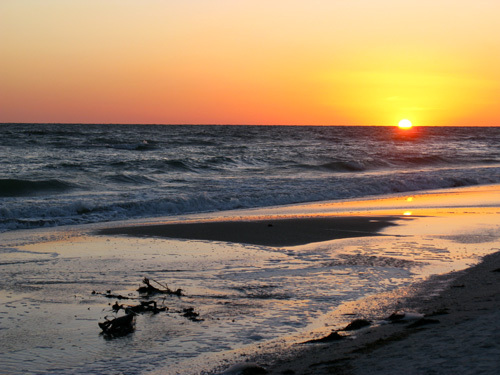 This little Florida Gulf beach town is located on the last two miles of Sand Key. It is home to about 4600 people who chose it for its easy pace, beautiful white beaches under deep-blue skies, and lack of major crime. Madeira Beach pretty much starts about 155th Avenue on the north boundary and ends at Johns Pass Village to the south. You can easily walk to shopping, the few little beach bars, and places to eat across Gulf Blvd. There are plenty of beach rentals to stay in, but likewise, you will find much better pricing across the main road. The three largest parking lots for Madeira Beach access are located at Archibald Beach Park at the huge log cabin on the northern end by the intersection of Madeira Way - the County Park between 144th Avenue and 146th Avenue - and Johns Pass Beach/South Beach located directly across from the shopping complex at Johns Pass . The cost now is 25 cents for 15 minutes ($1 per hour), however many Florida beaches are moving to 25 cents for 12 minutes so do not be surprised if this changes quickly. The best thing to do is buy a couple of rolls of Quarters and keep several handy. Parking is strictly enforced on the Pinellas Barrier Islands and you don't want your Florida beach vacation ruined by getting a ticket. Madeira Beach Florida offers a quietness away from crowds of young people. It is NOT a major Spring Break destination. College kids who want the excitement and high-energy of mingling with new people will stay on Clearwater Beach about 10 miles north or St Pete Beach to the south. Those seeking a retirement in Florida that consists of relaxed morning walks on the beach, swimming in clean Gulf water, and reading and napping in the sunshine, and experiencing beautiful Florida sunsets will want to checkout Madeira Beach. I don't want to give you the idea that Madeira Beach FL is a two-mile stretch of isolated white sand with infrequent beach retirees. Families pretty much gather at the three main public beach access areas noted above. You can rent chaise lounges and umbrellas, kids can run and laugh, and there are both restrooms and outside showers available at Archibald Beach Park and the County Park Beach. 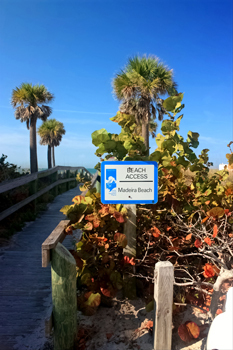 It is easy to see why many include Madeira Beach FL in their list of top Florida beaches. Where are some good places to eat on Madeira Beach?